Upon entering the Museum of Contemporary Art Chicago’s Kovler Atrium, audiences will find rows of pews from University of Chicago’s Bond Chapel. The pews were removed in order to provide Muslim students a place to pray. 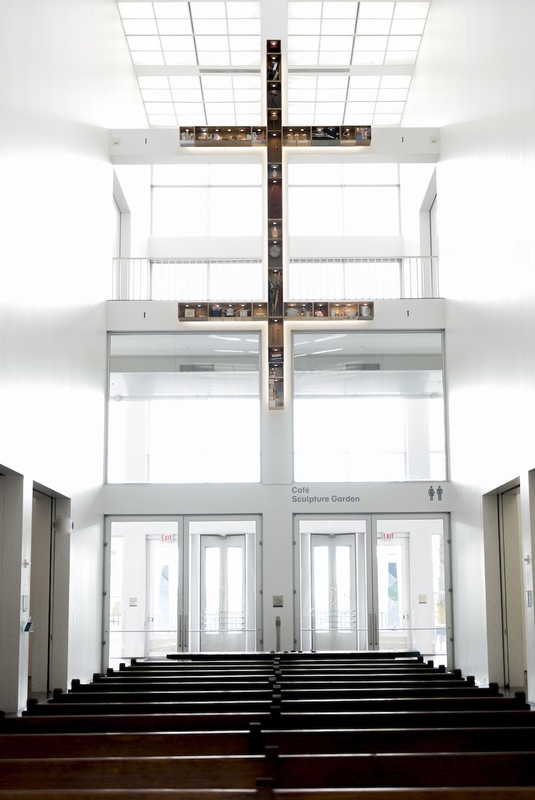 Above the pews hangs a large-scale double-cross sculpture filled with household items such as umbrellas, dented cans for non-perishables, and wine glasses. 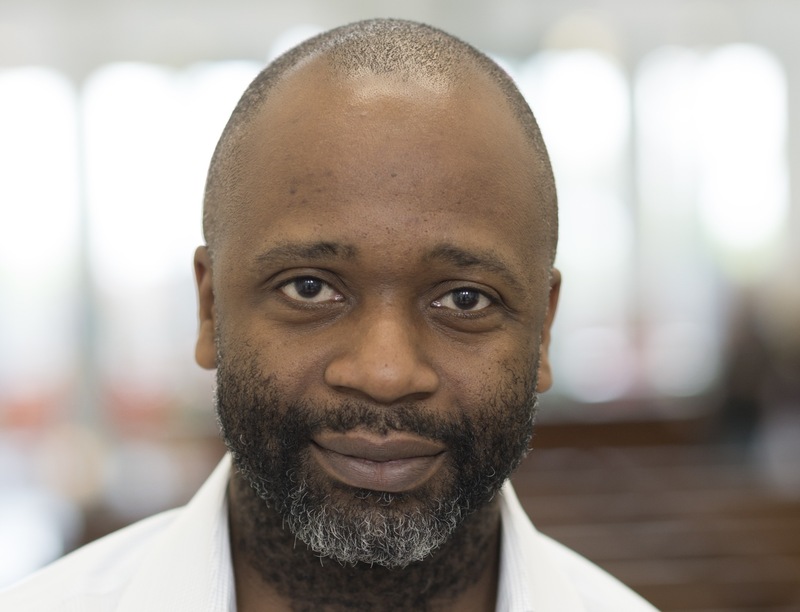 The installation will be activated with performances throughout the summer by artist Theaster Gates. The installation is titled 13th Ballad and intertwines concepts and theories, a familiar practice for the Gates. Here we see the relationship between religion, migration and accumulation. Gates’ work intervenes and it is this intervention that serves not as another example of gentrification, but of the possibilities of art in the face of despair. Gates is a multidisciplinary artist, working with performance, sculpture, installation, and large-scale urban interventions. He received a degree in urban planning, but also studied ceramic. This combination of fields informs the multifaceted approach to his artistic practices. His works are not just objects. He manipulates, reconstructs, and activates them in order to breathe further life into the end result. In 12 Ballads for Huguenot House (a work created in both Chicago and Kassel, Germany for dOCUMENTA (13)) and 13th Ballad, his work mimics Chicago itself. Chicago is a city on the precipice of two narratives. Which way will we go? Which way will we allow our buildings and schools and neighborhoods and people to go? On the one end, there is the city of progress and prosperity. This is in some ways the surface Chicago. That does not exclude the very real lived reality of many Chicagoans who suffer little. But to those who have an intimate relationship with the parts of the city that are too often plagued with neglect, this is not the full story. On the other end, there is the city in decline. In a conversation with Carolyn Christov-Bakargiev for a book on 12 Ballads for Huguenot House, Gates said, “I spend a lot of my time asking: how can I activate places that have been neglected, underresourced?” Gates’ work in large part deals with ideas of reconstruction and repurpose. What can be done with this? What is missing from this object’s narrative? This is not just characterized through the philosophical. Rather, he literally reclaims materials to, if not recreate, then reiterate its value and historicity. This first began with the purchase of his own home and studio, an abandoned store on Dorchester Avenue in the Grand Crossing neighborhood. His efforts later extended to purchasing more buildings in and around the area, repurposing them as archives and a cultural center. For 12 Ballads, Gates aimed to unite two unused buildings (one in Chicago, the other, built in the 19th century and located in Germany) by using parts of each to rebuild the other. In Gates’ work, we see the importance of discovery and the challenge against abandonment. Most importantly, his work does not rely on just what is there, but also on what could be there. Theaster Gates is Chicago. In a city full of artists of a variety of different artistic practices, Gates rises above the rest to create multidisciplinary works that speak to the spirit, anxieties, and troubles of Chicago itself. That his prestige and success reaches beyond the limitations of this city speaks to the criticalness of his work. Gates both is Chicago and speaks in conversation with Chicago and the realities of the city. If Chicago is a city of “potential,” then Theaster sees it already. He sees it right now. 13th Ballad runs through October 16.